How to get started with microcontrollers is a very common question, and can be quite daunting for the newcomer. We will start right from the beginning, assuming almost no prior knowledge of the subject. Although we will probably cover other micros in later tutorials, we will start with the very popular PIC microcontroller range from Microchip. A means of programming your microcontroller with the code you have written (generally known as “firmware”) There are hundreds of programmers to choose from out there, ranging from cheap “hobbyist type” to very expensive production programmers. For me, an important feature of the programmer is the ability to debug your code, and be able to be driven from within MPLAB or MPLABX – these are Microchips Integrated Development Environments (IDEs – we will cover these shortly) Personally, I recommend either the PICkit3 or the ICD3, as these are the two I have experience with. Both have the features mentioned above, the only difference is that the ICD3 does a little more on the debugging side, programs faster and is a “production programmer”. The is a comparison of their relative features here. If you don’t know what to start with, I’d go for the PICkit3. A tool with which to organise your projects and write your code (an IDE) Microchip provides MPLAB and MPLABX for this purpose. MPLAB was the only IDE from Microchip for a long time, but recently MPLABX has been released and is the new IDE Microchip are focusing on. It’s based on Netbeans, and you get a feature packed tool somewhat like Eclipse/Visual Studio. I would pick MPLABX here, as it has many more features, plus MPLAB will probably be discontinued at some future point. If you are going to follow this tutorial right through to the end, then now would be good time to start downloading and installing MPLABX, and the XC8 compiler (free version – in the left column of the linked page) whilst you are reading the rest. Don’t worry if you have no components yet, if you wish you can use the simulator to run the code presented later on. For this all you need is your computer. Something to test your microcontroller with. This could be a Development Board, or simply a breadboard you can layout yourself. On the dev board side, at $70 the PICkit3 starter kit is a pretty good choice; it’s on this page along with other starter kits. It comes with everything you need to get started, plus some tutorials on basic assembly programming. Olimex and other independent vendors also make some good dev boards. On the breadboard side, it’s a little more complex but more versatile, plus you will probably learn more this way. Which you choose depends on how much of a challenge you feel up to. We will cover the breadboard option here, but the discussion of coding and firmware will be just as relevant whichever option you take. 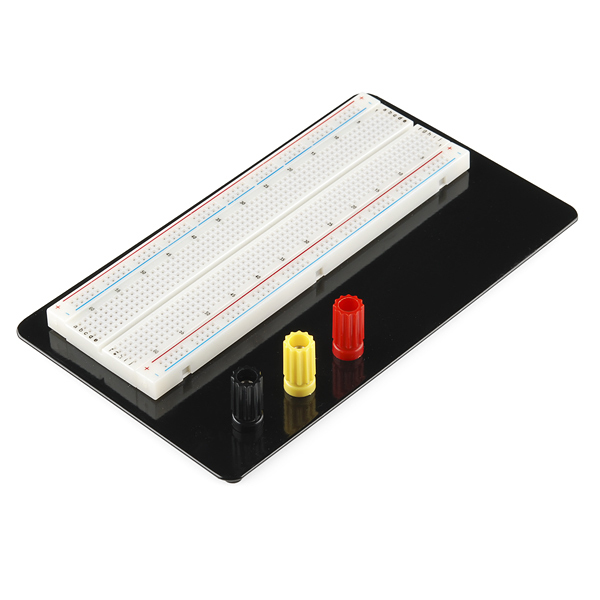 Breadboard – preferably select a decent size one with power tie points as shown above. A load of jumper wires to connect your circuit together with. You can either buy some ready made ones such as these or these, or buy a roll of single core wire (I use 0.6mm which is equivalent to ~22.5AWG, but 22AWG or 20AWG should do fine) and cut your own. A header to plug your programmer into during programing/debugging – this depends on which programmer you have. For the PICkit3 you need a simple 6-pin 2.54mm pitch header, whilst for an ICD3 you need either an RJ-11 (6-pin type), an RJ11 to 6-pin header adapter or this very convenient breadboard cable adapter. Capacitors – 20 x 100nF ceramic capacitors (also listed as 0.1uF, which is the same value, 1nF is 1/1000th of a uF) – you will use a lot of these. 10pF, 15pF and 22pF ceramic (here are some options). 10uF, 100uF, 220uF, 470uF electrolytic types. There are also starter kits available which combine many of the common values. Crystals – the modern PICs have an internal oscillator (this is the thing that supplies the clock to the internal circuit) but it’s not as accurate timing wise as using an external crystal. Some applications require accurate timing, such as serial communications (e.g. RS232 or USB between PIC and PC) so you may want to grab some of these. Typical handy values are 32.768kHz, 4MHz, 8MHz, 12MHz, 20MHz. LEDs – you need something to indicate events, an LED is a cheap and simple way of doing this. They come in many colours, shapes and sizes, but start off with some simple 5mm red LEDs. General purpose transistors – you will need these for various things along the way, often for driving things that the PIC pins don’t have enough power to handle. There are two main types of transistor, bipolar and FET (Field Effect Transistor) Both have their uses. The choice of parts is overwhelming – some BC337-40 NPN, BC327 PNP, and some BS270 N-ch MOSFETs are a good start. 7-segment displays, LCDs, Buzzers, Sensors, Motors – the list is endless once you get past the basics. Again, there are sensor kits available from places like Sparkfun, Adafruit, and other vendors if you want a basic selection handy for future use. The datasheet, or a related app note will often have a minimum operational diagram. Googling a bit for things like (“PIC schematic”, “PIC16F starter kit schematic”, etc) brings up plenty of useful info. Using the “images” search option is often a good way to find what you are looking for. If you are not used to reading schematics, all the symbols marked the same are physically connected to each other (this saves making things messy by having to draw wires everywhere) For example, the little arrow with V+ above it is connected to all the other V+ symbols (V+ is your supply voltage, typically +5V for this PIC which can be supplied from your PICkit3 or ICD3 – not all programmers have this option though). Also the little downwards pointing triangle made from three horizontal lines means circuit ground, and these points are all connected together. Same again with the symbol marked RA3, the point over on the right is connected to pin 4 of the microcontroller which has the same symbol attached to it. This is the same schematic as the previous one (it’s good to get used to seeing schematics in different formats), but we have added an LEDs and resistor in for blinking purposes. Ignore the yellow capacitor at the right middle (it’s part of another circuit on the same board) You can see the 100nF capacitor across the power pins, the anode of the LED connected to RB7, it’s cathode connected to the resistor then the resistor connects to the circuit ground at the top (pin 20 of the microcontroller) Also you can see the 10kΩ resistor between MCLR (pin 4) and the positive supply pin (Vcc – pin 1) The wires plugged into the board are the adapter wires from the ICD3 breadboard cable adapter previously mentioned above – the unlabelled blue wire plugged into the left hand side is the Vpp (programming voltage) connection . Select Standalone Project and click next. You will be presented with the dialog box below.We now need to select the part we will be using, so select Mid Range 8-bit MCUs and PIC16F690 (or if you are using another similar part 20-pin like the PIC16F685, PIC16F687, PIC16F689, etc, then select this instead) and click next. You will now be asked to select an optional debug header (these parts do not have on chip debug capabilities) which we won’t be using, so just click next. Now we get a dialog asking to select a tool for programming (e.g. a PICkit3, ICD3, etc) I have my ICD3 plugged in so I have selected this. Select your tool and click next. Now we have to select the compiler we will be using, so we choose the XC8 compiler we downloaded before (if you didn’t, here’s the compiler page link again) You may have other compilers installed (as you can see I have) so make sure the XC8 compiler is highlighted and click next. Okay, we’re finally done setting up the project, now we can write the code. Under the “Projects” tab, right click on “Source Files” and select “C Main File”. This will create a basic template main file for you. You can rename it if you like from the default “newmain”, I called it “led_blink”. And that’s it, just copy the above code and replace the entire contents of the file with it. You will notice we changed the intial header files (e.g. #include stdio.h and stlib.h) and added #include <xc.h>. We also added a rather important line, the #pragma WDTE = OFF – this turns the watchdog timer off. The watchdog timer is a timer that needs to be reset before it times out otherwise it will reset your microcontroller. This can be useful in case the microcontroller hangs for whatever reason, but we don’t need it here as it adds complications. I hope this is of use to a few people. If you spotted any mistakes, have any questions, ideas for improvement, suggestions for future tutorials, then leave a comment and I’ll do my best to answer promptly. Thanks for very nice tutorial, using xc8. Very nice and straight forward, well explained & documented. For my first crawl in PIC programming this gave me understanding of the process. Good job! Thanks. Just what I was looking for: an easy to follow introduction to the PIC microcontroller without needing a Starter Kit. In schematic, LED should connect to RB6(pin 11). Thanks a bunch! This is a big help for a noob. This is exactly what I was looking for. Kudos to you for taking your time to write out a great tutorial. Just one thing that came to my mind: wouldn’t it be smarter to set i in the delay function to 99 instead of 100? That way, along with the d decrement, you get 100 instructions, i.e. one millisecond – or am I missing something here? You raise a good and valid point, however this was only meant to be a *very* rough delay routine so an instruction here or there wasn’t an issue (the while check takes up time also). The main objective was simplicity here for a first project tutorial. If you did need more accurate timing then you would need to take such things into account. There are a few options for improvement such as: writing the routine in assembly, using the timing tool in MPLABX to count the exact number of instructions per loop, using the timer peripheral, using the microchip library delay routines (which are well worth examining for tips on how to adjust for different clock speeds or PICs) etc. If you look at my other tutorial on the timer and interrupts, you will notice this very issue is discussed and the benefits of using the timer peripheral and interrupts for tighter timing and better use of CPU time are mentioned. Could you also give pointers or explain in detail on how to go with designing the circuit .. like why a resistor goes here and a capacitor overthere..?